This KHUPO meeting will be a great opportunity to meet many distinguished scientists from this field. The organizer would like to welcome any contribution towards the success. 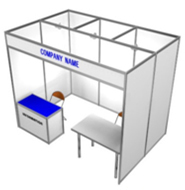 The Shell Scheme Stand is inclusive of Space (3m X 2m) assembled with aluminum frame.